your son may need a coach, another a seamstress or beautician. WIth all of these duties as a mother, one may find it hard to take time for running a business. Scheduling meetings, client appointments, production, promotions, and accounting is all a part of entrepreneurship and balancing these tasks, with the duties of motherhood gracefully, is difficult to imagine. Difficult to imagine, indeed, but it is possible. This was Moms in Business’ vision in hosting their first women’s conference, “Balancing it all with grace and ease,” on May 6 at the RFS event center in downtown Toledo. Though there was rain on that day, inside were women radiating with pride near their booths, showcasing their businesses. Guests enjoyed a lovely spread of refreshments was provided by The Olive Garden, and the venue was decorated for the occasion. Bry Zeigler is the visionary behind Moms In Business and the conference. A mother of two, a human resources manager and student at the University of Toledo, Zeigler wanted to have an open discussion amongst like minded aspiring and current entrepreneur mothers willing to share their success stories, give tips and advice. The keynote address was given by Sheila Speights, community relations rep for Buckeye Health Plan. 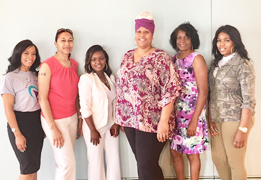 The panelists included Lladheena Shabazz, Tiara Armstrong, Shasta Hill and D’Amber Barrett who shared their experiences with finding balance, managing schedules, and even dealing with challenges in a graceful way. Some of the panelists also have full time jobs while establishing or managing their businesses. Guests could ask questions and receive answers from the panelists, and there was an opportunity to support the women owned businesses represented in the vendor area. Attendees also were entered to win raffle prizes and networked with the mompreneurs. To learn more about Moms In Business and how you can connect for support, contact Moms Toledo on Facebook or, Bry Zeigler via email at momsinbusiness419@gmail.com.